Raveon’s RV-M7 UHF data radio modems are industrial-grade, high-speed, FCC and CE certified data radios designed for telemetry, SCADA, AVL, wireless data, mobile-data and remote control applications. 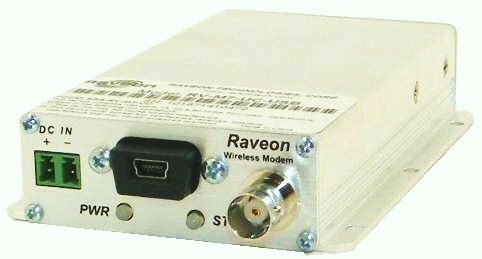 Designed by Raveon for long-range reliable communication using high-performance RF circuitry and filters, it is also feature-rich.With fast over-the-air data rates and fast transmit-to-receive switching, Raveon’s M7 UHF data radio transceiver increases data throughput in narrow-band wireless systems. Included in each unit, are advanced networking, error correction, and diagnostics. It may be ordered with an IP65 weatherproof enclosure or a ruggedized enclosure to withstand extreme environments (see datasheet for our ruggedized UHF radio). And because it is built using rugged “single-board” construction, it is extremely rugged – and cost effective. With prices for radio transceivers starting below $400 the M7 is the most powerful, most economical data radio available.The Optional internal GPS ( GX option) enables the M7 to transmit its position, data, and status (voltage, speed, heading, temperature, I/O bits.) a pre-set intervals using either conventional carrier-sense methods or with efficient TDMA channel access. A GPS tracking system built with M7 transceivers, can track up to 20 radios with one-second updates or 200 with 10-second updated. The M7 is the fastest most efficient UHF AVL radio available. See details on its GPS tracking and TDMA abilities. The M7 leads the industry in many areas including technology, features, and price. It has some of the fastest over-the-air data rates, TX-RX switching times, and power-on times. It is one of the smallest data radios in its class. It is one of the most rugged data radios made. It is one of the lowest power-consumption radios available. And its price will pleasantly surprise you. Competitive Features(pdf) Document AN131 describes the unique features of the M7wireless modem. Some of the M7’s features are available in other company’s products, but no other wireless modem on the market has as rich and complete set of a feature as Raveon’s FireLine. DIN rail mounting clips. Two clips included. These clips are secured tothe the bottom of the M7 series of radio modems. When secured to the the M7, the M7 will clip onto a standard DIN rail. The field termination terminal block is very useful for interfacing the M7 radio modem with the RS-485 and RS-422 devices. Customer ordering the RS422/485 option should also order this field termination block because it makes installation very easy. AC-DC power supply for M7 series of data radios. 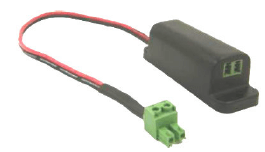 DC power cord for M7 series data radio modems. Each M7 radio is shipped with one, RT-CB-H1. In-Line DC Surge Protector. The RV-SP-x is designed to be plugged in-line with the DC input to electrical devices that may be subject to over-voltage (> 16V) events, large transient voltage spikes, electrical noise, or RF noise. It filters the DC and protects the connected device from over-voltage and transient events. USB Option for M7 series of data radios. USB option replaces the standard DB9 RS232 serial connector with a USB 2.0 MINI-B connector and internal a USB-Serial bridge. All features and functions of the M7 remain available via the USB connection. Picture of M7 with USB option installed.